Ductless heat pumps offer Victoria home owners and rental apartment owners an economical heating and cooling solution that is hard to beat. In addition to all the benefits of a regular heat pump, ductless heat pump systems can be installed in virtually any space without the use of air ducts, making them much easier and more affordable to install. Ductless heat pumps systems don’t need expensive and invasive ductwork, so you can retain the height of ceilings and look of rooms. Installation is as simple as mounting indoor and outdoor units, hooking up a refrigerant line through a three-inch opening in the wall or ceiling, and making a few electrical connections. Most installations can be completed in as little as one day. Indoor heads are typically mounted high on a room wall or in a recessed ceiling covering, enabling each room to be heated and cooled independently. Due to their smaller size and high efficiency, ductless heat pumps tend to be much quieter than conventional heat pumps. 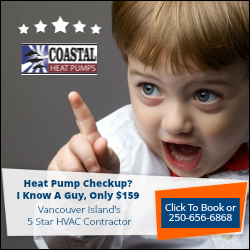 Coastal Heat Pumps has tested all the top ductless brands, and we’ve found this to be consistent across the board. Ductless systems are ideal for replacing or supplementing inefficient electric baseboard, wall or ceiling units, wood stoves, and other space heaters such as propane or kerosene. A cost effective electric heat conversion in a small house might consist of a ductless system serving the main living area, while leaving existing electric baseboards in bedrooms and bathrooms for supplementary heat when needed. A ductless heat pump system can also be a great solution when a room is added onto a house or an attic is converted to living space. Rather than extending the home’s existing duct work or adding electric resistance heaters, a ductless heat pump can provide efficient heating and cooling at a lower operational cost.